NATURALLY NEPAL "once is not enough"
KATHMANDU — A 50-year-old Russian climber died Wednesday attempting to scale Mount Everest in this season's fourth death on the world's highest peak, a government official said. Alex Bolotov was found dead on Wednesday morning at Khumbu Icefall at 5,600 metres (18,372 feet), the official told AFP by telephone from Everest base camp. "He seems to have left his tent at around three in the morning. When his Sherpa went looking for him, his dead body was found in the Khumbu Icefall" at the head of the Khumbu Glacier, government official Gyanendra Shrestha said. 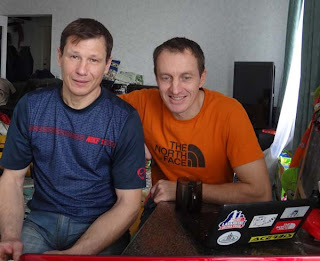 Shrestha said the Russian, who has climbed several major peaks including K2, Makalu, Manaslu and Annapurna, was part of the Everest South-West Face Expedition and was trying to repeat his 2002 summit of Everest. Three other climbers have died on the world's highest peak this season. Last month Mingmar Sherpa, 47, a member of an elite team known as the "icefall doctors" who set up climbing routes, plunged to his death. DaRita Sherpa, 47, died from what is believed to have been cardiac arrest earlier this month. Lobsang Sherpa, 22, a member of a team guiding a commercial expedition, died a week ago. Some 300 people have perished trying to reach the 8,848-meter (29,029-foot) summit during the last six decades. The bodies of some of them are still there. May is considered the optimum time for climbing in the Nepalese Himalayas and some 28 people have reached the top so far this year. Trekking in Nepal will take you through a country that has captured the imagination of mountaineers and explorers for more than 100 years. Nepal Trekking, Trekking in Nepal, Nepal Hiking, Everest Trekking, Annapurna Trekking, Langtang Trekking, Tour in Nepal, Nepal Adventure Trekking, Holidays in Nepal, Trekking in Nepal Himalaya, Nepal Trek, Trek Nepal, Nepal Trekking Information, Padyatra Nepal. Mount Meru Treks offers adventure travel information and Share Information about Traveling in Nepal and south east asia.